Earthy, rich, charming. Those words are the first things that come to mind upon hearing the voice of Nancy Harms. 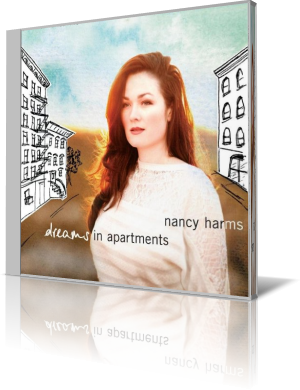 Dreams in Apartments (Gazelle Records, 2013) presents Harms with limited accompaniment, counterbalanced by original songs and fresh arrangements of classics. Born in Clara City, Minnesota, Harms didn’t have the gift of being born in a musical family. And she was further limited in that exposure to jazz didn’t occur until she went to college. At that point, her future was determined. Though she went into teaching immediately after college, she eventually gave that up in favor of a career in jazz. “Weight of the World,” penned by Harms, is a folksy message song. Harms sings like one might expect to hear Joan Baez if she did jazz. Miller’s parade drum beat enhances the underscore. Here’s one you don’t hear every day. “From My First Moment (Gymnopedie for Piano No. 1),” adapted from the 1888 composition by Erik Satie. It’s interesting hearing the melody in human voice with lyrics. Parks and Hart provide accompaniment. Harms is true to the elegance of the classical composition, injecting her own flavor. Harms is a fixture in the Minneapolis-St. Paul jazz scene. She wrote or co-wrote four of the 10 songs on Dreams in Apartments.